Totally Tipster! 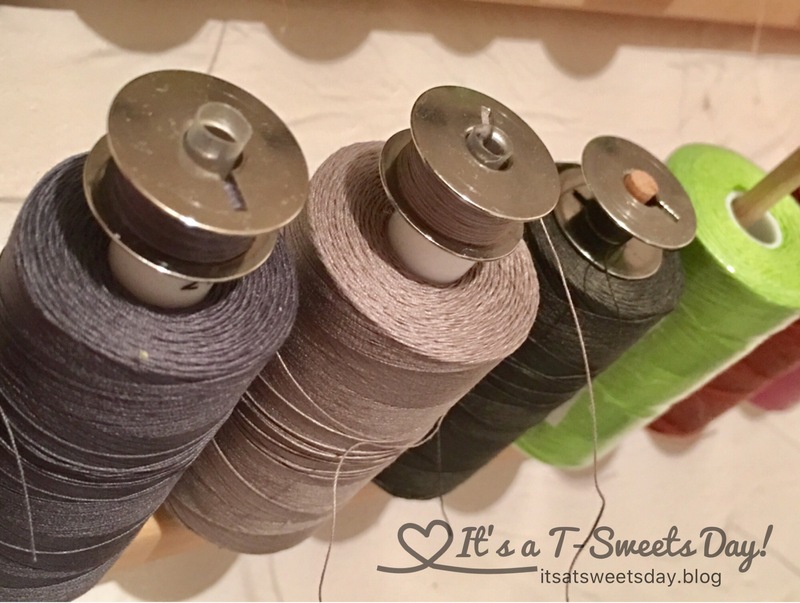 – Thread & Bobbin Storage – It's a T-Sweets day! 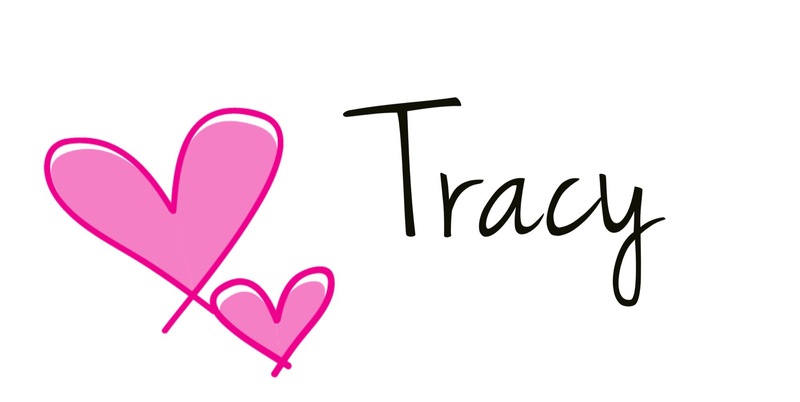 Published on January 5, 2017 January 6, 2017 by Tracy @ It's a T-Sweets Day! I have quite a few thread spools. Maybe not as many as some of you and maybe quite a bit more than others. I am sure you all have your own working system on how you like to store yours. Buy extra bobbins for your machine. – I bought 20, but will be buying more. Invest in a peg rack.- they are about $20. on amazon. –SO Sew worth it!! 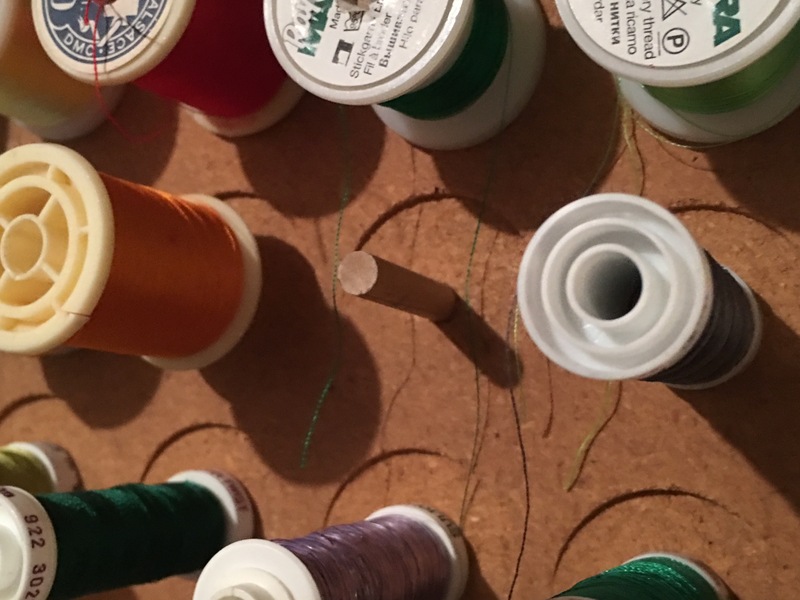 Store your thread and matching bobbin thread together on the same peg. 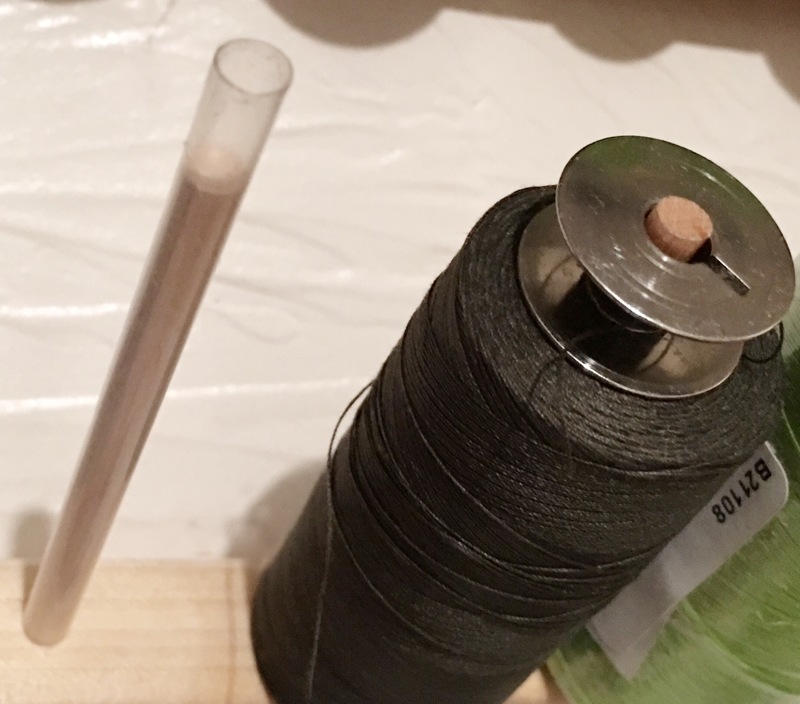 If your spool is too tall for the bobbin to fit as well, cut a straw to your desired length and place it over the peg to lengthen it. Now that is Totally Tipster!! What an easy fix! I lengthened my smaller rack the same way, but my pegs are too wide for my bobbins. Bummer… oh well, there is a bobbin rack attached to the top of my board. It works but not nearly as well as the skinnier pegs on the other rack.. I like how the straws give stability to some of my more awkward embroidery thread. Storing my thread this way has been such a time saver for me. It makes finding that matching bobbin a SWEET dream! No more holding up bobbins to see if it is the thread. Just grab and sew! 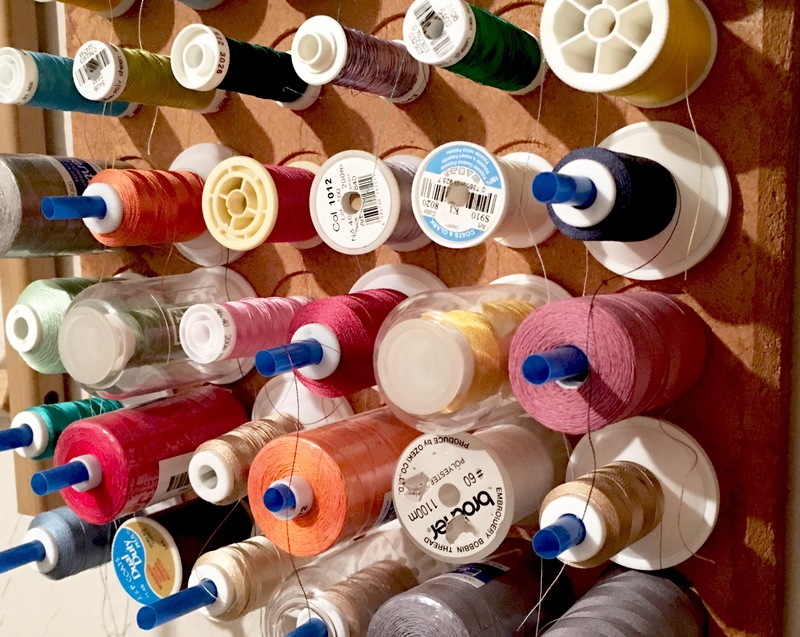 I have very similar racks for my threads and bobbins, with the quilting weight and sewing weights separated. I put my bobbin under the thread spool, so that the core of the spool supports itself, rather than the bobbin wobbling about on top. And I’m glad it’s not just me that simply has to have everything sorted by colour! I also have the ‘ugly’ corner, where I keep the dayglo orange for repairing the Husband’s work clothes, the rusty colour for sewing denim, etc. It’s where I go for basting threads that I want to see easily when it comes to pulling them out. The “ugly” corner– lol! We are kindred spirits:)! I have an ‘ugly corner’ in my fabric cupboard too, full of “what was I thinking?” fat quarters…. love the idea… I see you have alot of thread from Connecting Threads. Is that your favorite for piecing? Hi Brenda:). Yes, Connecting Threads works perfectly in my Juki machine. I know a lot of people rave about aurifil, but it breaks after a few stitches every time. Thank you for your question and happy quilting:)! Love the straw idea, thanks! 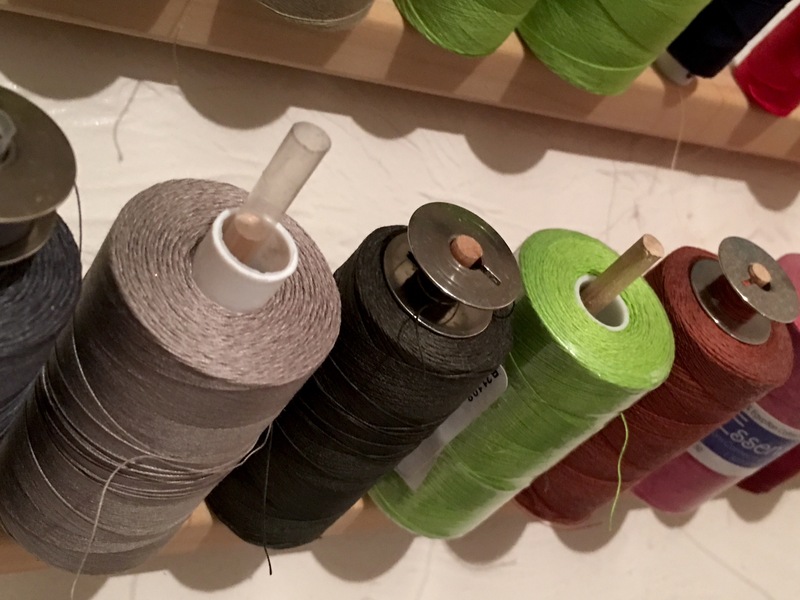 When I bought my longarm in 1995, my husband made a thread rack for me. He made a grid of nails spaced just the right distance for my bobbins and put a board underneath across the bottom would slant out from the wall and they wouldn’t slip off. I could put multiple bobbins of one color on each nail, to match the spools I had sitting on shelving right next to it. I really miss that now! No longarm any more, but I miss it anyway. Aren’t husbands the best?! I am in the process of buying a long arm gammill now. I just need a place to put it– add a barn to the price!! I totally get you! I have three too- lol! I rack the bobbins for the machine I use most and store the others in the other machine storage compartment. 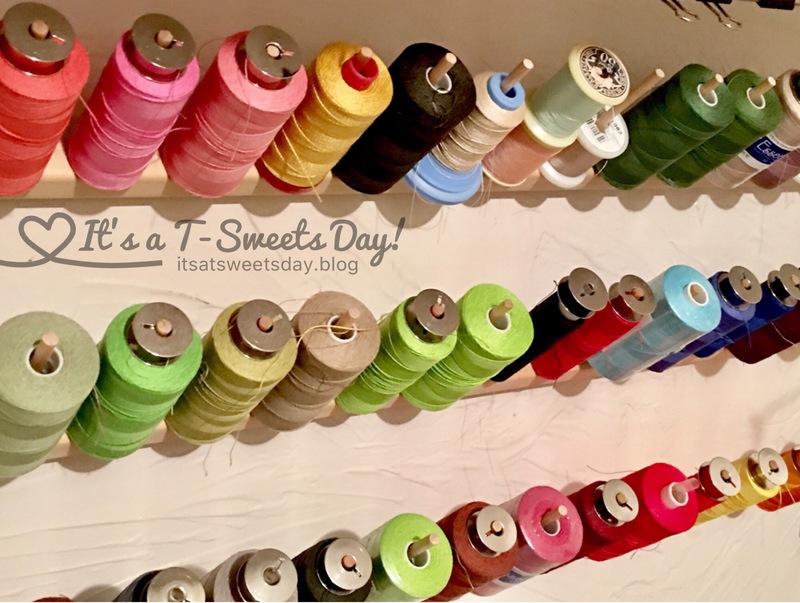 Pingback: Totally Tipster Sewing Garden – It's a T-Sweets day!